At Gold Coast Solar Power Solutions we’ve been supplying and installing REC solar panels since 2010. With the installation of thousands of REC solar panels across the Gold Coast and Brisbane since we can highly recommend REC solar panels for being both a high performance and high-quality product. With headquarters in Norway, REC is an international solar company employing thousands of people worldwide. REC solar panels are manufactured at a state of the art automated production facility in Singapore. More than 200 patents granted or pending. REC TwinPeak 2 Series solar panels use unique and innovative technologies, and a ground breaking layout to give you a high efficiency and high power output product. Based on 120 laser cut polycrystalline cells, the REC TwinPeak 2 Series includes four different technologies which together, result in an extra output of over 20 Watts per solar panel, a class leading efficiency of up to 17.7% and set new standards for polycrystalline solar panels. 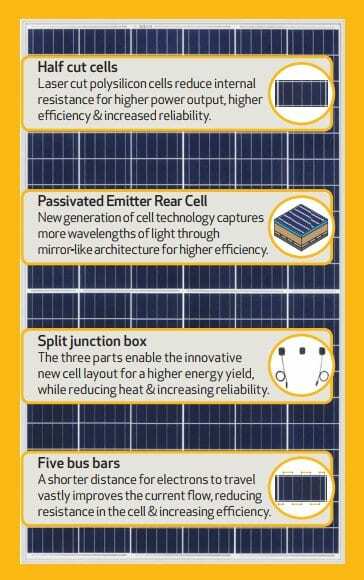 Packing in the technological advancements shown here means REC TwinPeak solar panels give you more power output per square meter than standard 60-cell competition. This means that in areas with limited space such as rooftops, you can fit in more electricity generation capacity and make maximum use of the available space. One of the major advantages of the REC TwinPeak Series compared to standard solar panels is their ability to generate electricity when partially shaded. This helps you produce more energy over time from your solar panel installation. If any part of a standard solar panel is shaded it will lose the production from at least one string or one-third of its power production and even stop generating power altogether if it’s shaded across the width of the panel. REC TwinPeak solar panels are split into two twin sections which generate electricity independent to each other, and then combine again before the current exits the panel. This helps them to continue producing electricity in the non-shaded section even at times of reduced light on the panel. Just another way the REC TwinPeak solar panels can increase the overall yield and profitability of your solar power system. Another great feature of the REC Twin Peak 2 solar panels is their very impressive temperature co-efficient of -0.36% per degree – very simply this means that in high temperatures REC Twin Peak 2 solar panels will be producing more power than other solar panels of comparable wattage. For more information on solar panels and temperature please click here.